Nominations are now being accepted for the Fellows of the Academy of Professional Reporters, the NCRA Board of Directors, and the Distinguished Service Award. 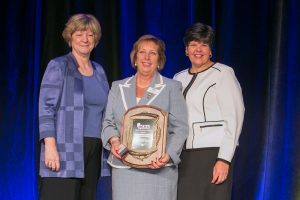 Now is the perfect time to step up and nominate yourself or a colleague to serve or be recognized for his or her commitment to the profession and to NCRA. Members of the 2017 class of Fellows of the Academy of Professional Reporters was recognized at the 2017 Convention & Expo. Nominations for 2018 Fellows are due Dec. 31. 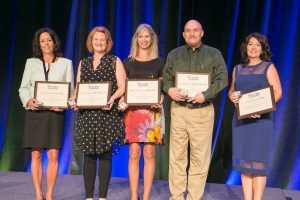 NCRA’s Council of the Academy of Professional Reporters is seeking nominations for its Fellows of the Academy of Professional Reporters (FAPR). The deadline to nominate a candidate is Dec. 31. Membership in the Academy symbolizes excellence among NCRA members. The designation of FAPR represents an individual’s dedication to the court reporting and captioning professions and expresses the highest level of professional ethics. Candidates must have been actively reporting for at least 10 years and have attained distinction as measured by performance. This performance could include publication of important papers, creative contributions, service on committees or boards, teaching, and more. “It is an honor to carry the distinction as a Fellow in my profession’s national association. Much of the time and energy devoted to my beloved profession and association has been behind the scenes; when I learned I had been awarded the Fellow, it let me know that my hard work and dedication had been not only noticed but appreciated,” said Sarah Nageotte, FAPR, RDR, CRR, CRC, an official court reporter from Jefferson, Ohio. Nageotte was inducted as a Fellow in 2017. “There’s a quote that says, ‘Volunteers are not paid — not because they are worthless, but because they are priceless.’ Taking the time to recognize a colleague through a nomination is one way to say thank you for always giving for the betterment of all. If you don’t nominate someone deserving, who will?” added Nageotte, who is also an NCRA Past President. To nominate an individual, view the full criteria and download a nomination form at NCRA.org/Fellows. For more information, contact Cynthia Bruce Andrews at candrews@ncra.org. Serving on the Board of Directors is an excellent opportunity to use your leadership skills to help advance the premier organization that continues to empower the court reporting profession. As a Director, you will serve with others as fiduciaries to steer the organization towards a sustainable future by adopting sound, ethical, and legal governance and financial management policies as well as by making sure NCRA has adequate resources to advance its mission. “After serving on NCRA committees and task forces, observing and respecting NCRA’s leaders, as well as holding several offices with my state association, I decided to challenge myself and seek a position on NCRA’s Board,” said R. Douglas Friend, FAPR, RDR, CRR, a freelance reporter an agency owner from Vancouver, Wash., and a Past President of NCRA. “A joy of serving on the NCRA Board is attending state conventions and making presentations. Besides meeting reporters who became friends around North America, I also gathered confidence in public speaking. As a firm owner, this helped in speaking to groups of attorneys, legal assistants, and paralegals,” added Friend. Nominations and recommendations can be submitted to boardnominations@ncra.org by Jan. 19, 2018. As a courtesy, please contact your candidate directly prior to submitting his or her name. Anyone interested in seeking future Board service can attend a no-obligation orientation webinar on Jan. 10 at 8 p.m. ET. This webinar will help you gain a better understanding of the process and expectations of serving on the Board. For more information about the orientation, contact lbutler@ncra.org. NCRA’s Distinguished Service Award is often viewed as the pinnacle of a member’s career. It recognizes the distinguished work and service by an individual member for the benefit of the court reporting profession, including service to NCRA as a member, a committee member, a director, or an officer of the Association. Other displays of distinguished work include contributing to the JCR or service at a state court reporters association or in the field of public relations or public affairs. Award winners are recognized at the NCRA Convention & Expo. “In 2015, at the NCRA Convention & Expo in New York City, I was humbled that I had been nominated and had been chosen to receive the DSA,” said Sandy VanderPol, FAPR, RMR, CRR, a freelancer and firm owner from Lotus, Calif.
“This award was such an honor, and I will always remember the ceremony and the many emotions that passed over me when my name was called. I tell you this because I want each of you to take the time to reflect upon what this award means to the recipient. Nominate a person you consider worthy, and be proud that you have been a part of the process,” she added. Voting members of NCRA or of recognized court reporting associations may submit nominations through an online form, by email to dsa@ncra.org, or by mail to NCRA, Attn: DSA, 12030 Sunrise Valley Dr., Reston, VA 20191. Nominations must include information supporting why the nominee should be considered. DSA candidates cannot be an active member of the DSA Committee or the NCRA Board of Directors. The deadline to nominate a member for NCRA’s 56th Distinguished Service Award is Feb. 9.